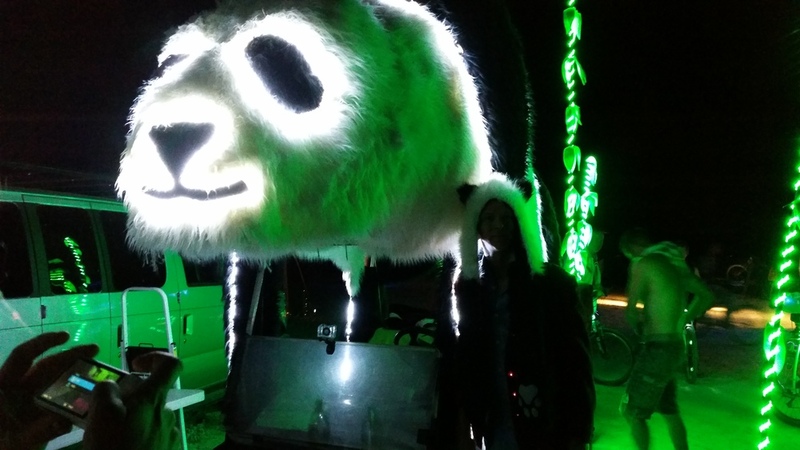 2015 Derpy "The Playa Panda"
2014 was a tough year for us. We spent a ton of time building our mutant vehicle. We finished him on the Playa on Tuesday night and were able to drive him around the playa only for a few days. We got a bad call on Thursday and found out our dog was dying so we needed to leave the playa immediately. To make matters worse, on the drive back home, we got a bad call from Eric's doctor and we were told that they found skin cancer on his hand. Despite the bad news and the passing of our pet, we vowed to return to the playa. In 2015, we re-designed Derpy and decided to bring him back, but right before the trip to Burning Man, Tracy, had an accident and broke her leg and was not able to attend the trip. Eric gifted Tracy's ticket and another ticket to two friends to help with the Playa Panda Project. By doing so, "created" 2 more Burning Man lovers. In 2015, we made Derpy even better with "Derpy version 2.0". Below you will see our new design. The main difference was the addition of the red canopy to help protect the passengers from the heat. It was a huge success. Here are a list of upgrades to the new Mutant Vehicle for Burning Man 2015. Here is how the new rear canopy turned out. Passengers really enjoyed the coverage from the sun. Here are photos from 2015 and 2014.